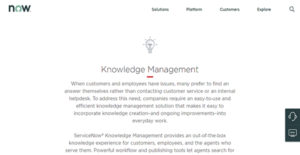 What is ServiceNow Knowledge Management? ServiceNow Knowledge Management is an out-of-the-box solution for sharing information in knowledge bases for customers, employees, and agents to easily access. Through this application that makes up a part of the Now Platform, your users can create articles and other help items for the members of the knowledge team to categorize, review, and approve. As knowledge management is work for a large group, ServiceNow Knowledge Management lets you divide people into multiple units. This way, you can delegate tasks to different managers and their team members. The software has dedicated workflows to publishing and retiring articles, and there are distinct access controls for reading and contributing, too. When the knowledge team have published articles, you as well as other users can search for the relevant information in the knowledge repository to help you quickly resolve issues. ServiceNow Knowledge Management even enables you to simply browse pieces and leave feedback in any page. Issues not resolved quickly can cost your employees time and the company money. With ServiceNow Knowledge Management, you afford users the ability to find the solutions and apply them immediately. By providing swift access to troubleshooting information, you empower your users to help themselves and to keep the workflow running smoothly. As knowledge bases burgeon over time due to numerous articles from different departments, the searching and browsing process for the correct resolution can add more minutes to the time a problem is standing. However, ServiceNow Knowledge Management has an answer to that as it utilizes contextual search in its information retrieval. With this, your users get their precious minutes back and let them quickly attend to issues. ServiceNow Knowledge Management facilitates the creation of additional knowledge articles from resolutions and work processes. With this, everyone has immediate access to new critical information that can assist them in expediting their tasks. Answers to pressing problems may be found among the members of your communities. As ServiceNow Knowledge Management is part of the greater Now Platform, you can connect it with your community portal where users ask for help and aid others in finding solutions to their problems. From there, you can harvest knowledge and turn them into valuable articles. Articles can have further revisions in light of additional solutions. Those to whom these are relevant need to be informed as they are published. ServiceNow Knowledge Management aids you in that regard as it allows your employees, customers, and agents to subscribe to articles for them to be notified of the latest updates. With ServiceNow Knowledge Management, you can understand what problems your users encounter often and how fast your knowledge teams work. The application has a dashboard where you can view pertinent usage and publishing metrics that allow you to determine whether you need to adjust the publication workflow or conduct seminars to inform users. If you are interested in ServiceNow Knowledge Management it might also be beneficial to analyze other subcategories of Best Knowledge Management Software listed in our database of SaaS software reviews. Since each enterprise has unique business wants, it is prudent for them to desist from looking for a one-size-fits-all faultless software application. Needless to say, it would be pointless to try to find such a system even among popular software solutions. The clever thing to do would be to jot down the various important factors that need consideration such as required features, budget, skill levels of workers, company size etc. Then, you should do your homework thoroughly. Read some ServiceNow Knowledge Management reviews and look into each of the other systems in your shortlist in detail. Such exhaustive homework can make sure you reject ill-fitting applications and choose the system that offers all the elements you require for business success. How Much Does ServiceNow Knowledge Management Cost? ServiceNow Knowledge Management is an application that lets companies share information via knowledge bases. If you want to enable your users to easily find data and help they need using this software, you can get in touch with the sales team for bespoke enterprise pricing. We realize that when you make a decision to buy Knowledge Management Software it’s important not only to see how experts evaluate it in their reviews, but also to find out if the real people and companies that buy it are actually satisfied with the product. That’s why we’ve created our behavior-based Customer Satisfaction Algorithm™ that gathers customer reviews, comments and ServiceNow Knowledge Management reviews across a wide range of social media sites. The data is then presented in an easy to digest form showing how many people had positive and negative experience with ServiceNow Knowledge Management. With that information at hand you should be equipped to make an informed buying decision that you won’t regret. What are ServiceNow Knowledge Management pricing details? What integrations are available for ServiceNow Knowledge Management?